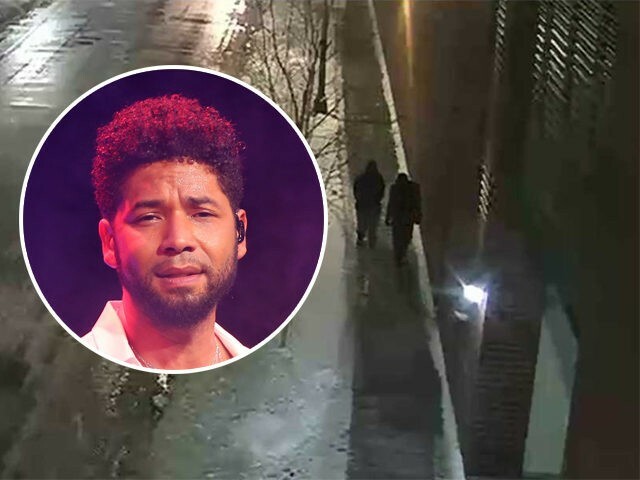 The two persons of interest in the alleged attack on Empire star Jussie Smollett are only seen on the opposite side of the street in the surveillance footage reviewed by Chicago police, according to a local reporter. On Wednesday, the Chicago Police Department released screenshots of two persons of interest in the alleged attack on Smollett. The Empire star told police he was returning from a fast food restaurant at around 2 a.m. when two men began hurling racial and homophobic slurs (Smollett is gay and black). During the alleged attack, Smollett says a rope was put around his neck, bleach was poured on him, and one of his attackers yelled, “This is MAGA country,” referring to President Trump’s “Make America Great Again” slogan. 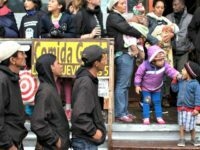 After poring through hundreds of hours of surveillance video, police found footage of two people who were in the vicinity of the attack around the time it allegedly occurred. Detectives used time code from two different cameras to piece together Smollett’s movements when he was near [the persons of interest]. On one camera the [persons of interest] are seated at a bench. The other camera shows Smollett across the street. Police say both Smollett and the “persons of interest” walk out of frame (on different cameras). Smollett would reappear on a different camera about a minute later. So basically for about 60 seconds Smollett is not on surveillance camera. Let me clarify. On one camera the “persons of interest” are seated at a bench. ACROSS the same street, Smollett is seen walking. Smollett is recorded on that different camera walking. The “persons of interest” are also seen walking, but on the other side of the same street. The next time Smollett is seen on surveillance camera, he is entering a condo building. Police say he now has a rope around his neck and is “wearing it like a neck tie”. About a minute (maybe less) has passed since he was seen on video. Smollett, according to investigators, walks in to the building, walks by building security and gets on an elevator. This video is better quality according to detectives. And what appears to be road salt is on his sweatshirt. Unknown so far is whether the persons of interest disappeared from the camera at the same time Smollett did. We also don’t know if the persons of interest are seen again, and if they are, are they walking or running away? What time did they arrive to sit on the bench? What time did they leave the bench? Were they walking in the same direction as Smollett? Two men sitting on a bench at 2 a.m. in the freezing cold in downtown Chicago does raise questions about why they were there.